Raised without religion, Adam Leith Gollner was struck by mankind’s tireless efforts to cheat aging and death. In a narrative that pivots between profundity and hilarity, he brings us into the world of those whose lives are shaped by a belief in immortality. From a Jesuit priest on his deathbed to anti-aging researchers at Harvard, Gollner–sorting truth from absurdity–canvasses religion and science for insight, along with an array of cults, myths, and fringe figures. He journeys to David Copperfield’s archipelago in the Bahamas, where the magician claims to have found “a liquid that reverses genes.” He explores a cryonics facility, attends a costume party set in the year 2068 with a group of radical life-extensionists, and soaks in the transformative mineral waters at the Esalen Institute. Looking to history, Gollner visits St. Augustine, Florida, where Ponce de Leon is thought to have sought the fountain of youth. Combining immersive reporting, rigorous research, and lyrical prose, Gollner charts the rise of longevity science from its alchemical beginnings to modern-day genetic interventions. He delves into the symbolic representation of eternal life and its connection to water. Interlaced throughout is a compelling meditation on the nature of belief, showing how every story we tell about immortality is a story about the meaning of death. Chapters include: Journey into Remoteness; The Valley of Astonishment; Lessons of the Teachings; The Magical Fountain; Escapology; The Sorcerer’s Lair; Transmuting Magic into Science; Mercurial Times; Biological Calculus; Refrigerator Heaven; Secret Santa Barabara; tons more. Published at $16.00, our price only $9.95. 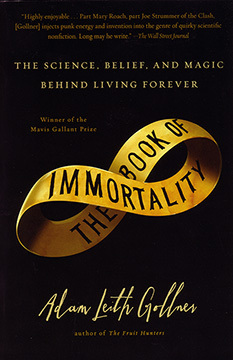 THE BOOK OF IMMORTALITY: The Science, Belief, and Magic of Living Forever By Adam Leith Gollner. 402 Pages. 5x8 Paperback. Bibliography. Index.